A man in downtown Atlanta with an electric scooter on June 26, 2018. Electric scooters are appearing in many major cities across the country, bringing fun to riders, profits to scooter makers — and lots of potential risks to walkers and riders. Scooters and pedestrians share a path in San Diego. Have the rideables come to your neighborhood yet? They will. 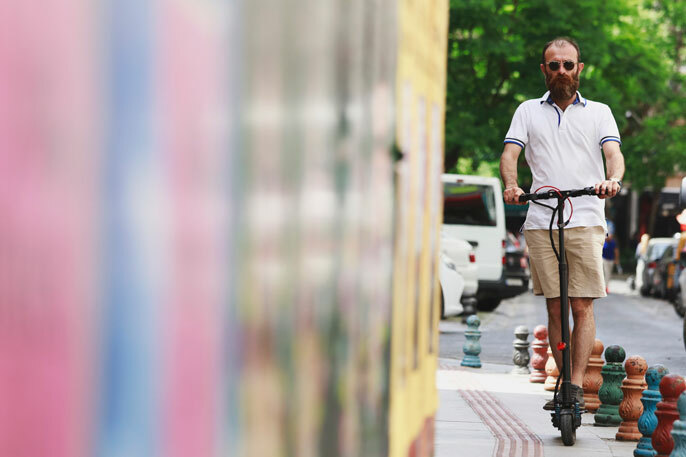 A market research company predicted electric scooters alone will grow from a US$14 billion global market in 2014 to $37 billion in 2024. Bird and Lime, the two biggest scooter makers and both based in California, have placed scooters in nearly 30 U.S. cities in recent months, leasing them to riders seeking a thrill — or an alternative to ride-sharing. If it seems like scooters are everywhere, it’s because they are springing up in cities, such as seen here in Milwaukee on July 12, 2018, across the country. This article was written by Jim Sallis, professorial fellow at the Mary MacKillop Institute for Health Research, Australian Catholic University, and emeritus professor, Department of Family Medicine and Public Health at the University of California, San Diego. This article was originally published on The Conversation. Read the original article.